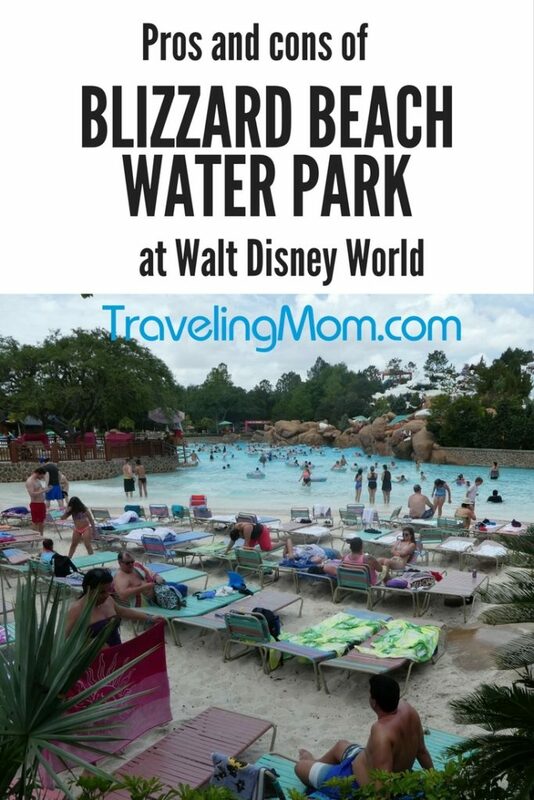 Home » Blog » Walt Disney World » Is Blizzard Beach Water Park Worth a Day Out of Disney World Parks? Photo by Jamie Bartosch/Suburban TravelingMom Blizzard Beach has drop slides, but also lots of water slides families can ride together. 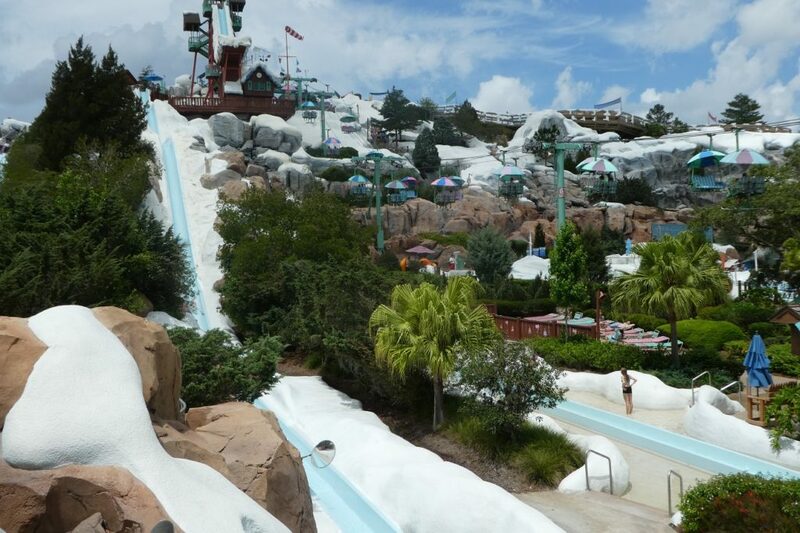 After numerous trips to Disney World spent in the parks, SuburbanTraveling Mom went rogue at Walt Disney World this year and took a detour to Blizzard Beach Water Park. Rather than spend all of our days on rides and roller coasters in the parks, she opted for a day at Blizzard Beach. 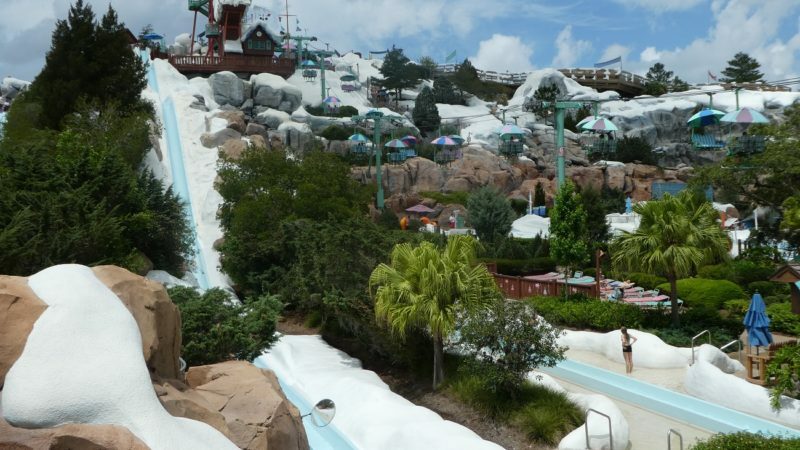 It’s one of two water parks on the Disney property (the other being Typhoon Lagoon), but what are the pros and cons of visiting Blizzard Beach? Blizzard Beach has drop slides, but also lots of water slides families can ride together. 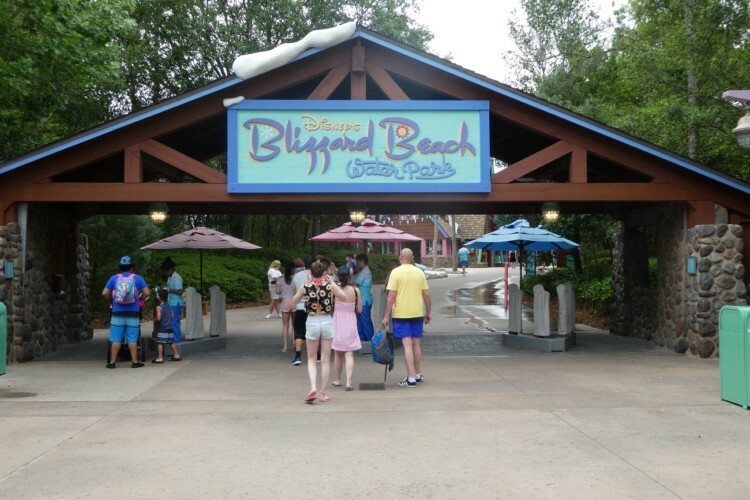 Should You Visit Blizzard Beach while at Walt Disney World? The temperatures were in the mid-90s – very hot for us Chicagoans – and everyone was tired from walking around the parks in the heat. We kept seeing the Blizzard Beach bus at our hotel. I figured the universe was trying to tell us something. As you’d expect from Disney, it’s an above-average water park in every way. We’ve been to a lot of water parks over the years – we live a short drive from Wisconsin Dells, the Waterpark Capital of the World. But this one was impressive. 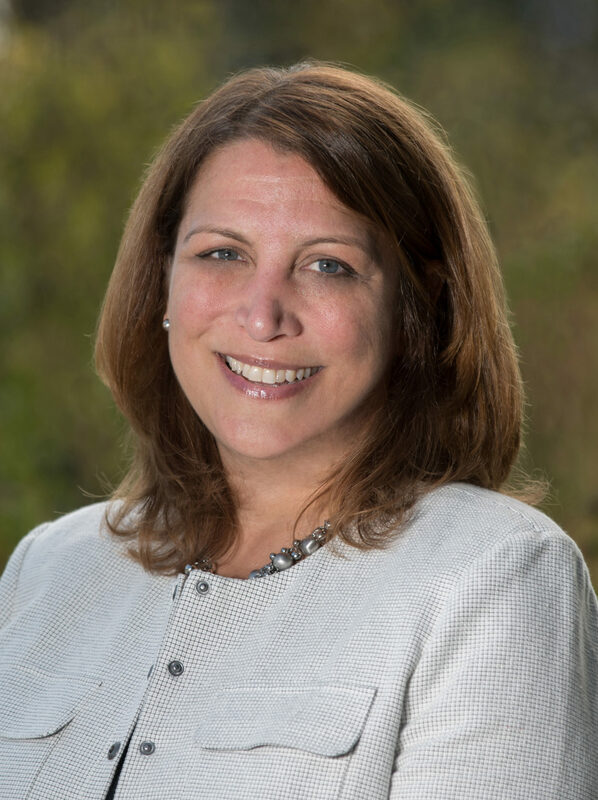 For me and my 11- and 13-year-old kids, it was a terrific change of pace. My whole family loved this water park, and highly recommend it. However, there are a few downsides. Blizzard Beach is one of two water parks at Walt Disney World. 1. There are a lot of water slides you can ride together, as a family. This feature is what made Blizzard Beach a home run in my book. At most water parks, my kids make a mad dash for the scary, single-ride slides and we spend a lot of time waiting for them at the exits. Here, we stuffed everything into a locker and all went on the slides together. Yes, quality family time in a water park! Sure, Blizzard Beach had a big single person plunge slide. But mostly, it had slides to accommodate two or more people at once. Our favorite was the Toboggan Slide, an 8-lane slide that you ride belly-down on a mat and race to the bottom. For a competitive family like mine, it was a blast. Another favorite was the umbrella-covered chairlift ride to the top of Teamboat Springs, one of those slides where everyone sits in one tube, and it swings back and forth as it goes down the slide. FUN! Of course, the lazy river, is always a great family ride. 2. The longest and most fun lazy river I’ve ever been on. The loop of this lazy river, called Cross Country Creek, was LONG! Which was awesome. I bet it took us 10 minutes to go completely around. While most of the river was relaxing, it had a cave with an ice-cold waterfall. When the cold water hit us, we all screamed, which echoed in the cave (which we loved). There were a few other water-shooting spots along the way, which were easily avoidable if you didn’t want to be splashed. 3. A great reprieve from walking, and the punishing Florida heat. It was 96 degrees in April when we visited. If that’s April in Orlando, I can’t imagine what summer feels like. Plus, everyone’s feet hurt from the past few days of walking through the Disney parks (you walk A LOT at Disney). Here, no walking, and no overheating. 4. Plenty of beach chairs and seating nooks. We went on a sunny, Sunday afternoon, and there were plenty of beach chairs. The layout includes lots of little nooks, which prevent you from feeling like you’re sitting with thousands of other people. 5. You will probably get to lay down at some point. Can’t do that at Magic Kingdom. 6. Tickets are less than Disney park tickets. Tickets are in the $45-$60 range per person, which is a bargain compared to Disney park tickets. 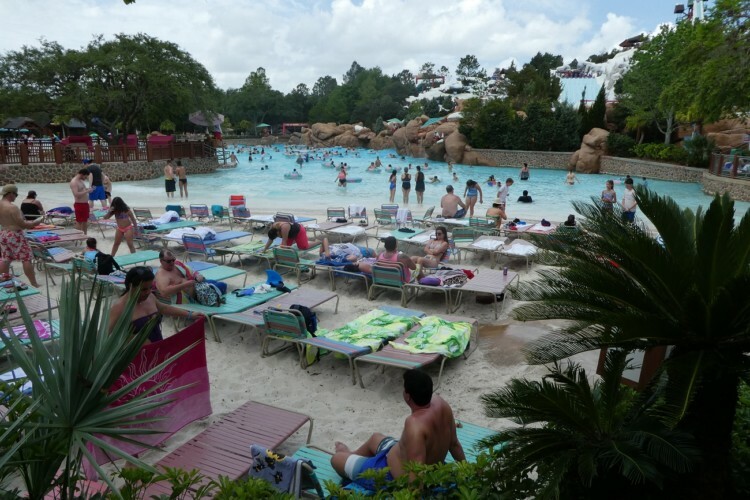 I wouldn’t call Blizzard Beach budget-friendly, but it’s a good value for a day at Disney. Plus, it’s a great water park! I don’t have a good strategy for finding discounted tickets (see below). But next time, I’m going to see what it would cost to include it as part of a Park Hopper. 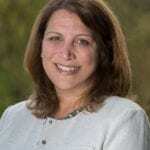 TravelingMom TIP: Frequent Flyer TravelingMom Leslie Harvey has a great post on the pros and cons of Park Hopper tickets. 1. 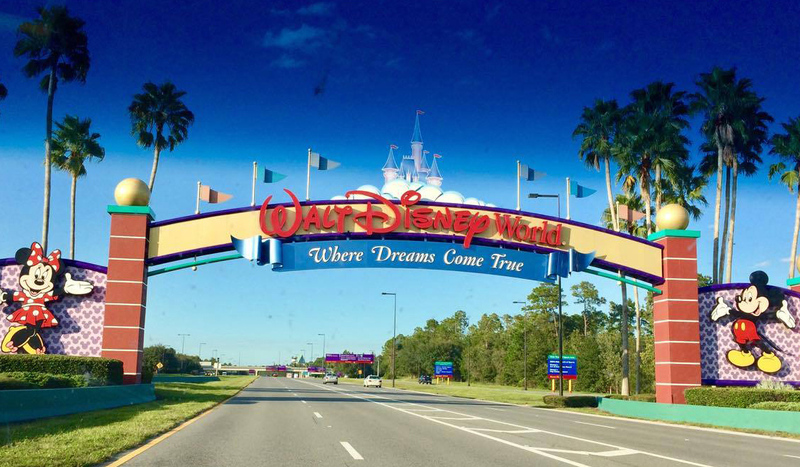 You give up a day in the Disney parks, the most magical place on Earth. There will be a little guilt involved. I mean, you’re at Walt Disney World, for cryin’ out loud. And the parks are absolutely fantastic. Why spend a whole day at a water park? 2. It can be buggy in spots. During our visit, there were swarms of little black bugs in the areas where people waited in line. When I say swarms, I mean SWARMS. They didn’t land on us or bite us, but they were really gross and annoying. And you couldn’t just swat them away. 3. $10 to rent a tiny locker? This is a petty complaint, but I really hate feeling nickel and dimed. So to pay $10 for a tiny locker felt like a “gotcha.” I never feel comfortable leaving my phone and wallet, especially not in a place with thousands of people walking around, so it was a must-buy. 4. It closes at 5 p.m.
And they started nudging us to leave at 4 p.m. Aw, come on. Can’t we stay just a LITTLE longer? 5. It’s hard to find last-minute discounted tickets. We decided the night before that we’d go to Blizzard Beach, so I scoured some unfamiliar websites looking for discounted tickets. Here’s the lesson I learned the hard way: If you’re staying on the Disney property, like I was, don’t buy them last minute from VisitOrlando.com. While they’re a good deal, they require you to pick them up at the Visit Orlando office in Orlando. No exceptions. And when the whole family’s standing at the entrance gate, ready to go in, you don’t want to hear that. As you can see, the pros far outweigh the cons! This water park was outstanding. On future Disney trips, a water park will definitely be on the agenda. If we are going to disneyworld for the first time do you think it’s worth it to leave the parks to go to a water park for the day? We have 7 day passes right now. Coral, I do think it’s worth it. A few straight days of parks is very tiring, especially in the Florida heat, because you walk SO much. This is a nice reprieve from that! But is it as magical as the parks? No. But it is super fun and my kids loved it! Hope you have a great trip.